Charge your iPhone 7 Plus and any other USB device quickly and conveniently with this compatible 2.5A high power Lightning charging kit. Featuring a UK wall adapter and Lightning cable. Two in the space of one! This item is great for charging two devices in one thus freeing up a plug socket for another appliance. Easy to use and efficient. A great purchase. This high power iPhone 7 Plus compatible charger features a mains charger with Lightning connection, so you can charge your quickly and conveniently. 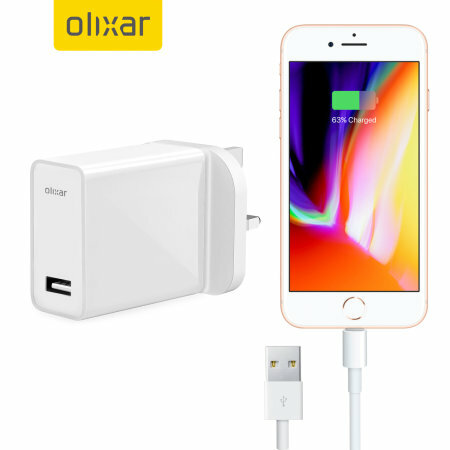 Don't limit yourself to the 1A charging rate the bundled iPhone 7 Plus power adapter provides as standard, instead double the speed with this 2.5A charger for high power, super fast charging. Taking full advantage of the iPhone 7 Plus's speedier charging rates, this super fast mains charger will ensure your smartphone is ready for action in no time - even when recharging from a completely flat battery. Along with your mains charger is a separate Lightning cable, which is compatible with the iPhone 7 Plus - so you have everything you need to keep your device topped up. The metre long cable gives you the freedom to charge your phone while keeping it in sight, so you'll never miss that call or alert. As this is fully compatible with iOS 7 and later, you won't get any annoying warnings. You can also be certain that it will work perfectly with your device.